It's party time! And what better way to get 'the show on the road' than to offer your guests a canape or two. 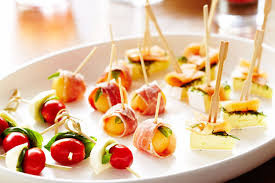 However, canapes may be tasty little party treats, but they can be notorious to eat with finesse. Never mind, help is at hand from Country Life magazine - this month's edition has a list of dos and don't to help us all through the Christmas party season. They go on to advise against the common trend, adopted by many supermarkets in their 'canape range', for making miniature versions of main meals, like pizzas, fish and chips or burgers. They say that however diminutive, they are not party food. 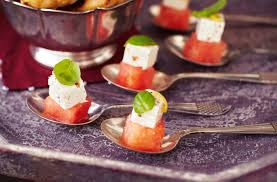 Neither should canapes be served on spoons - eating from large spoons is a private pleasure not a spectator sport, the magazine article says. Your guests need to look elegant when engaging in eating in public. Finally, the big 'no-no' - vol-au-vents are not to be considered canapes! And remember one golden rule - canapes are not a 'meal'. If you want to find out more on canape rules,then the latest edition of Country Life magazine is now on sale.